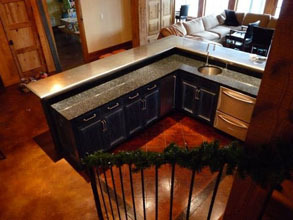 Custom Countertops - #3945 | Handcrafted Metal Inc. 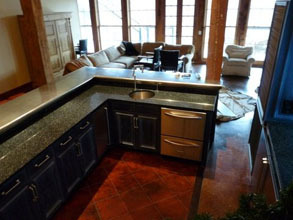 This long countertop has a pass-through opening in the backsplash that is centered on the extended front. Faceted caps extend beyond the front to cover posts below. The integral-welded 15" x 15" pewter sink includes double wall composite reinforced construction to make the malleable pewter dent resistant and durable. Our Mont St. Michel front gives this top a Nouveau flavor. Smooth pewter, semi-gloss finish.